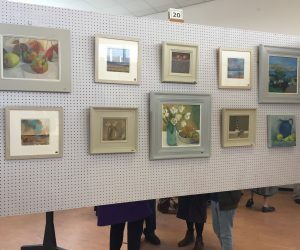 Molesey Art Society holds three annual art exhibitions. These exhibitions attract visitors from all over the country and especially local residents. Only full members will be allowed to exhibit at the exhibition. To join us, please contact the Membership Secretary, Evelyn Jones. Our Spring Exhibition is held early in April and all full members of the art society are invited to participate in the exhibition. This exhibition is also a Juried Exhibition with numerous awards for excellence in different mediums. The exhibition is open for approximately one week. Look out for our banner advertising the dates and times for this wonderful exhibition. Craft tables are set out at the venue and members exhibit craft items on their booked table. 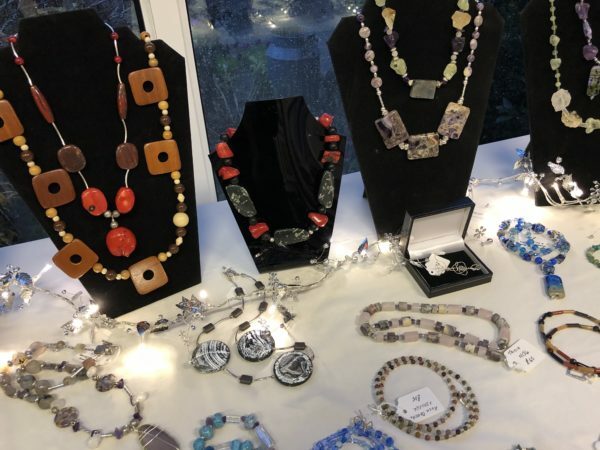 Items are for sale and encompass various crafts namely, jewellery, wood-turned bowls, sculptures, sewn items, cards. Paintings & drawings are exhibited on supplied exhibitors boards. There are also wooden browsers where members exhibit their unframed art works. Why not join the society so you can also take part in future exhibitions? Dates and times are advised approximately 2 months before the event. 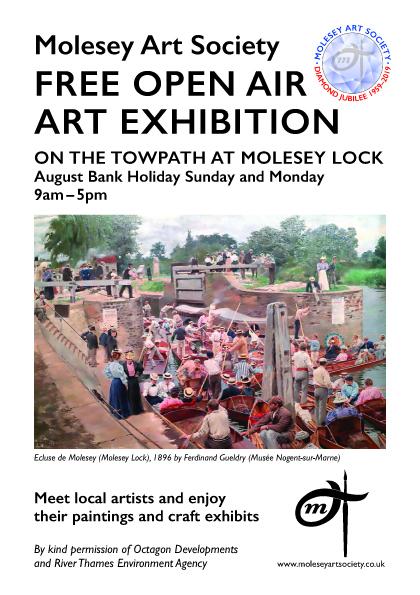 Our August Bank Holiday Exhibition is held at the Molesey Lock Towpath. 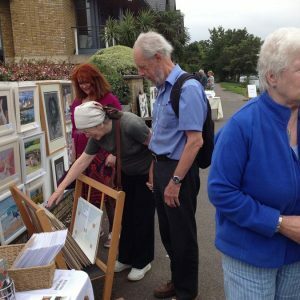 Members of the Molesey Art Society exhibit their artwork, crafts & cards on the towpath alongside the Lock. All members must bring their own tables, chairs and display boards. 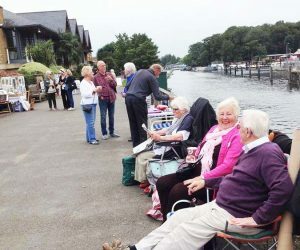 Teas, coffees and light snacks can be purchased at the Molesey Lock Cafe. Previous events here have been enjoyed by exhibitors and visitors alike. So, whether you wish to exhibit or just come and chat to us, please pop along to visit us. Our Autumn Fair is held in November and all full members of the art society are invited to participate in the exhibition. 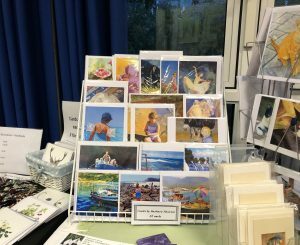 The exhibition is held over a weekend and members of the Molesey Art Society exhibit their artwork, crafts & cards at the venue. So, whether you wish to exhibit or just come and chat to us, please call or email the Secretary.